And so and so forth is what I have been hearing at all gatherings, ever since my involvement with Sindhishaan. With emotions deeply stirred by these sentiments, I too joined the chorus and jumped on to the Sindhiat wave. Then one fine day my 24 year old son Amit said, “Papa, its really exhilarating and thrilling what we are doing at Sindhishaan, but some friends of mine want to know what exactly we mean by Sindhiat – can you give me a definition of Sindhiat.” I spontaneously opened my mouth to answer . . . . . but then stopped – couldn’t find the words! I managed to get out of a tricky situation with my son but the fact struck home and I kept pondering on this issue for a long time. 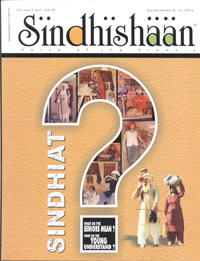 Would Sindhiat mean the same to a person in Mumbai or in London or in Hong Kong or anywhere else? What exactly are we seeking to preserve? The language?, the dress?, the cuisine?, the festivals? Or a special and unique way of leading life? I realized I had to get to the crux of the matter. You must appreciate that Sindhishaan is as much a part of a learning curve for me as with others to the lack of adequate knowledge on this subject. But I am trying to learn, to understand, to quench my thirst for information that till now I hadn’t bothered about in my life. And I am sure there are others like me all over, with the same urge to know more about ourselves as Sindhis. The Sindhishaan team drew up a questionnaire on Sindhiat, which was then sent to the peers of our community who have been doing their utmost to keep the torch of Sidnhiat aflame. The questionnaire was also sent to all members registered on our site. This issue features what eminent personalities like K. R. Malkani, Jhammatmal Wadhwani, Kirat Babani, Tajal Bewas, Ram Panjwani, Arjan Shad, Krishin Rahi, Popati Hiranandani, Hari Dilgir, Lachman Khubchandani and many others, have to say in definition of the term ‘Sindhiat’. The response was fabulous. Fabulous to the extent that not even a special Sindhiat issue could have done absolute justice to the topic, but either ways, we have gone ahead with the attempt of making a serious beginning, with the hope that the contents would ignite the feelings of the reader and put him into serious introspection and make him ask himself – How to keep the torch of Sindhiat aflame. Could this be called the awakening?